A Naples, Florida resident for 30 years, writer Maureen Sullivan-Hartung credits her mother for her love of the written word; reminiscing of days gone by on her mother's canopy bed as a child while her mother read stories. Fast forward to 1993, when Sullivan-Hartung applied for a photographer's position with the weekly Everglades Echo newspaper and came away with a reporting assignment - in addition to taking photos. With Everglades City as her assigned "beat" she soon became immersed in the community and fell in love with its charm and many colorful characters. Who knew that this reporter's position would also bring an actual paper route with it too - at age 40?!? Within weeks of this reporter position she had the privilege of meeting the late Totch Brown, a Chokoloskee native, who took her out on his boat and through the Ten Thousand Islands on their very first meeting. What an incredible experience, especially for a rookie reporter; and it not only changed her career path but it also opened her eyes to the beauty of this area and cinched her love affair of this Last Frontier. Sullivan-Hartung continues to pitch stories to various editors on this historic area, wanting everyone to come to know and love it as she does. 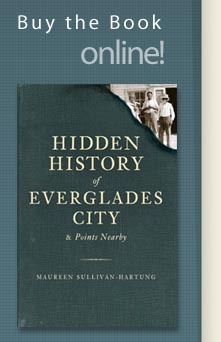 Hidden History of Everglades City and Points Nearby is her first book for The History Press.